In the past, I've avoided splitting up my recipe notes from my tasting notes, as many other homebrew blogs do. It seems like an unnecessary amount of work for a straightforward pale ale or IPA, and kind of confusing, putting the recipe out there before I even know if it's any good. But I know I have a tendency to get rambley and long-winded, and I'm sure I risk alienating some readers with the length of my recipe write-ups. So now that I'm doing more brews that require a long aging process, it seems neglectful to wait a year to get anything up on the blog. From now on, for certain beers, I'm going to start splitting up the brew-day from the tasting. 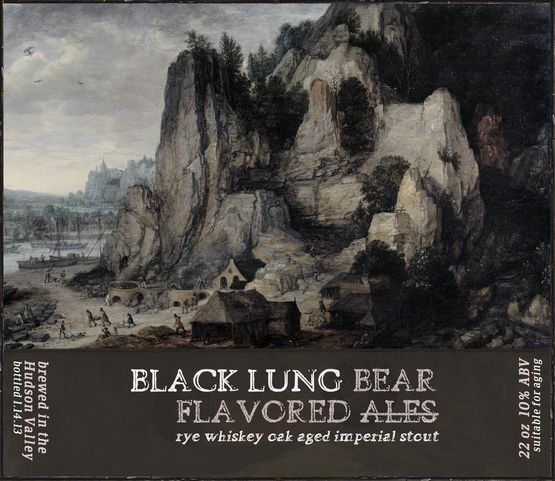 A couple weeks ago, I brewed an imperial rye stout to be aged on rye whiskey-soaked oak cubes (code-name "Black Lung.") A big oaky stout like this is something I hope to have in my repertoire of regularly-brewed recipes, although my first, 2011 attempt was a disappointment: too sweet and licorice-y, not nearly roasty enough, and with no noticeable bourbon character. Excessive sweetness is a problem that a lot of imperial stouts — including many highly-rated commercial stouts — suffer from. To combat that this time, I avoided any caramel malts, added a pound of dark brown sugar to the grain bill, and pitched both Safale S-04 English yeast along with a small dose of Conan yeast, which boasts 80-82% attenuation, and should help to clean up a few gravity points of residual sugar. The brown sugar, along with the rye whiskey, should push the ABV to 10% or higher without finishing sweet and syrupy, while the chocolate rye and Simpsons golden naked oats in the grain bill, in addition to a high mash temp, should retain the thick body an imperial stout deserves. My main worry is that this will still come out too thin, but hopefully within a rebrews I can find a happy medium between body and balanced sweetness. This will be the highest ABV beer I've brewed to date, but I'm fairly confident in my recipe. My strategy with high ABV beers that include sugar additions is to add the sugar in stages after the main fermentation has slowed, so the yeast has a smaller meal to attack at once, and doesn't get stressed from the outset. Here, I added a half pound of brown sugar after four days, another quarter pound a few days after that, and the final quarter pound around the two week mark. I started fermentation at 62 degrees F — keeping it on the cool side — and let warm up to 64 after the first brown sugar addition. Medium toast American oak cubes went into secondary as I transferred, where I'll let this age for two or three months, or until it's sufficiently oaky enough for me. I'll add the rye whiskey, to taste, a week or two after fermentation is definitely, completely done. Originally this was going to get bourbon, but as I was shopping, the rye whiskey caught my eye and I figured it would compliment the rye malt in the grain bill. If I'm really impressed, I'll keep it; if it doesn't make much difference, it'll be bourbon again next time. One advantage homebrewers have over major breweries and their barrel-aging programs, is the ability to control how much whiskey is added to the beer without blending. A brewery cannot legally pour liquor into their beer, but homebrewers can, and usually have to — unless we shell out for a barrel. Many barrel-aged beers end up absorbing too much liquor, in my opinion, and can become drowned out by booze. But a homebrewed beer can accept a more subtle dose without having to worry about blending batches for balance. To that end, I hope to focus more on the oak (cubes) and less on the rye whiskey, with just a background of booze to compliment the flavors this beer would normally form anyway. Hopefully, I'll be drinking the first bottles of this sometime in the spring, and aging the last few bottles of it for years to come. Gravity at 1.016. Flavor is a bit odd at the moment, more "woody" than "oaky." I was just going to ask you about possibly divulging the specifics on this beer before it matured. I started home brewing shortly after you did and came across your blog. It's been fun to read and learn from your brews as I make my own. Thanks. Thanks, it's great to hear you enjoy the blog. Anything I didn't cover in this post that you were curious about, with this recipe? Not really. I was mostly just curious to see the recipe as I develop my own for enjoyment next winter. Also, really enjoy reading about the beers up there in the NE (ex. Hill Farmstead, Ithaca), we don't see down in VA. Maybe a trade in the future? Yeah, for sure. New England has some great breweries. Wish I was closer to a few of them myself. If you're still formulating your recipe, and going for something similar, I would recommend maybe upping the rye and oats a bit. I feel like you can never have enough body with an imperial stout as long as you're not creating excess sweetness. Back on the topic of a trade. I have a bottle of this past years Hardywood Park Gingerbread Stout, and I'm looking to try that Heady Topper, or some Hill Farmstead.